Jolene Navarro checking in from the Texas Hill Country. It might be July but in my inbox, it’s all about Christmas. As an author when I see the subject line: Author Notifier I get all excited, just like a kid on Christmas morning. I have filled out the AFS and the art department has put together a cover for my story. That means I have a cover and preorders are up and running. This month I have received not just one but two such emails. Double the fun! 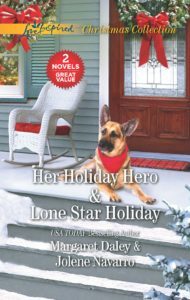 The first email I received is a reprint of my first book back in 2013, LONE STAR HOLIDAY. The best part is that it’s been packaged in a Christmas Collection with Margaret Daley’s Holiday Hero. In October it will be available in print and as an ebook. Lone Star Holiday: Lorrie Ann Ortega returns as the prodigal daughter. After years of living in Los Angeles, she finds that even with the financial success she became emotionally and spiritually bankrupt. For the Holidays she returns to the only home she ever had, her aunt’s pecan farm in Clear Water Texas. Widower Pastor John Levi had two things that mattered in his life, his congregation, and his two daughters. The last thing he was looking for was a relationship. No one in town believed Wild Child Lorrie Anne and their beloved pastor belonged together, but she just might be his Christmas miracle. The second email I received was the cover of my new release in November. Lone Star Christmas (Lone Star Legacy). It’s about the third Bergmann sister, Jackie and her rodeo teen sweetheart. It’s a bit of a Romeo and Juliet story, but they were smart enough not to die at the end. Determined to restore the historic buildings in Clear Water, Texas, Jackie Bergmann needs permission from the property’s new owner—her ex-boyfriend. And though Max Delgado agrees to give her access, he has one request: that she help him care for his orphaned brothers. But when she starts to fall for Max again, can she convince him not to sell his family’s ranch…and stay home for Christmas and forever? Can they heal the wounds left by generations of hurts? Here are some of the pictures I sent to the art department. What do you think? Did they hit the mark? 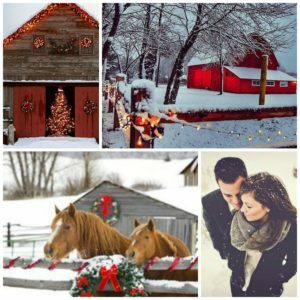 LONE STAR CHRISTMAS is my third Christmas story with Love Inspired (I have one Indie title Forever Christmas Kiss). I love writing Christmas stories. What I find interesting is the differences and similarities between the covers. I have one with the hero and his daughter, one with a horse in front of a barn, and the last one is just the barn. What do you think? People, animals or scenery? Do you have one that pulls you to pick up the book and read more than another? I’m drawn to covers with animals. Congrats on your upcoming releases. I love the animals too. I was hoping for a horse on my new cover but I guess it was too close to Texas Christmas Wish. Hi Jolene! I like bright cheery covers that coordinates with the title and the story. I also enjoy covers with animals, especially unusual ones: birds, pigs, hedgehogs. Congrats on your releases. I love Christmas in July – whether books or two whole weeks of Hallmark hristmas movies. Enjoy your weekend. Best wishes and Happy Writing. Thank you. I really wanted rabbits or baby goats on my The Solider’s Surprise Family. The heroine has a small farm of mismatched animals but they didn’t even put the dogs on the cover. LOL It was a sweet cover, but I wanted animals. I tend to be drawn to people or animals more than scenery. I really like the cover for Forever Christmas Kiss. I love people or animals on the cover. The Forever Christmas Kiss is my indie, so I had full control of the design. 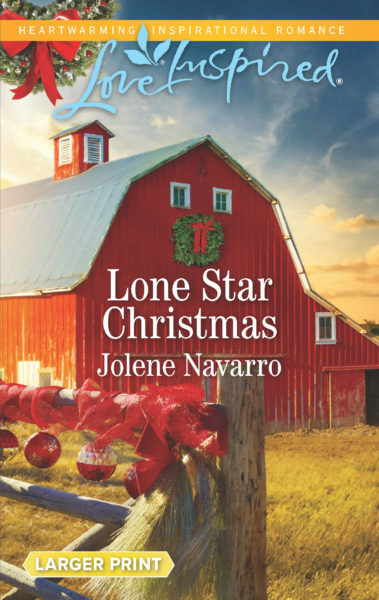 This new one Lone Star Christmas will be my first scenery only cover – I’ll have to see how it goes. Wow!! that is a tough question to answer, but I would have to say that any cover would catch my attention, as I am very easy to please when it comes to finding good books to read. Another is that animals with people is a great way to catch a reader’s attention. Congrats on your writing. I love all those covers, Jolene. Okay, maybe I like the one with the horse just a little bit more than the others, but they’re all beautiful. Congratulations on your upcoming releases! I love the one with the horse. It is also my best sellers. I was really hoping they would go with that idea, but maybe because I already had one book with a horse and barn. Lol who knows. I love both covers. I especially love the barn and red decorations. The LI artists always do a great job. I don’t have a preference about what’s on the cover, but I will say…as an animal lover…I love seeing animals on covers (and in stories)! Me too. I can’t imagine a story without animals. I like all the covers. I look for wholesome , peaceful covers. (I avoid the ones with too much skin. ). Lol. No skin on my covers.